Nobody is busier than a bride planning her wedding. In order to make it through the long days and nights of preparing the best wedding ever, the bride will need a pick-me-up from time to time. 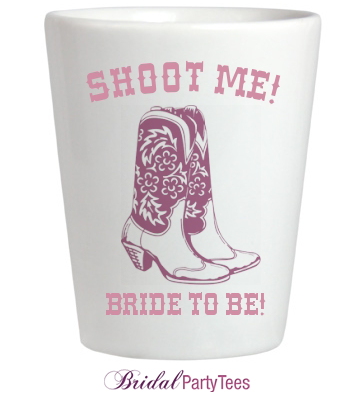 For many busy brides, that pick-me-up is coffee! It’s a magical sustenance that can turn any unreasonable bridezilla into an organized wedding planning machine. So for our brides that love coffee, we have created a line-up of star bride bridal shirts to go with this beverage of choice! Just how every coffee shop makes your coffee just the way you like it, we do the same with bridal shirts! Change these star bride shirts up by adding your name and wedding date or start with a blank shirt and create a completely new design for your wedding! It’s getting harder and harder for a bride to decide on what wedding traditions to make part of her wedding and which ones to bypass. The customary events of a wedding that were the must-haves ten years ago have somehow lost their luster with today’s modern bride. Many brides are willing to face a barrage of questions that will undoubtedly come their way from wedding guests looking forward to them, than to include certain traditions during the wedding day. Below are three wedding traditions that many brides are calling baloney on and choosing not to have as part of their wedding. While the groom may want to have this tradition at the wedding, it can be seen as a little risqué with grandma and grandpa in attendance. Knowing who didn’t use the gift registry or people second-guessing the gifts they gave is never a fun moment for the gift givers or the bride who really didn’t want the weed-whacker she just got from Uncle Bob. Why risk having the groom shoving the cake in your face if you really don’t want it to happen. Crowd cheering and wedding cocktails will always end in the bride wearing the cake instead of eating it. What are your thoughts brides? Are you done with these traditions? Chances are at some point in your life, you will be asked to stand up as the maid of honor for a friend’s or relative’s wedding. And when that happens, one of the biggest events you will be tasked with is planning the bachelorette party. It’ll be your responsibility to give the bride a memorable night by coordinating all the details and planning. But don’t worry; we already have some of the details covered for the bride’s last night out with custom bachelorette party accessories! One of the easiest ways to keep the vibe right for a bachelorette party is to have all the must have accessories and apparel that will keep the guests’ and bride’s energy high and ready to party! 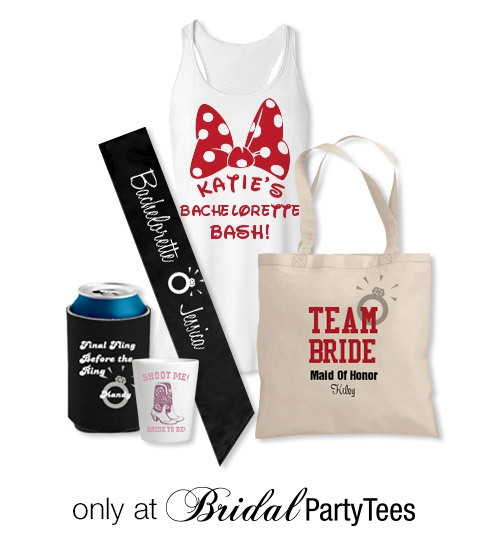 Below are the must have accessories and apparel that will help set up a successful bachelorette party! And better yet, we offer them all at Bridal Party Tees! 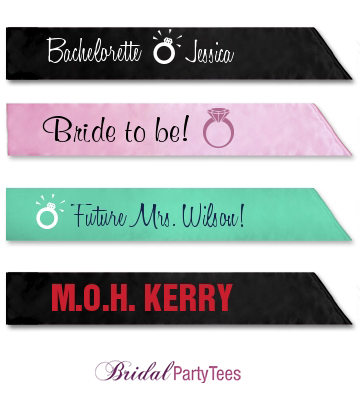 Get them all at BridalPartyTees.com! Cold feet. Everyone has heard of it and some might have even experienced it at their own wedding. It is the unwelcome thought of backing out on the wedding and no matter how much one tries to avoid it, it will probably cross the bride’s or someone else’s mind at some point. Lucky for you, we have the remedy to bypass cold feet with custom socks for the bride! 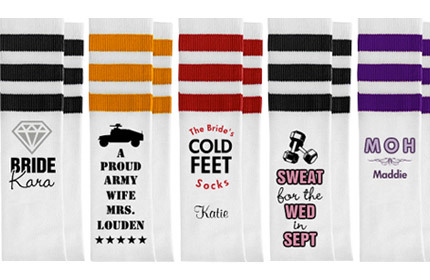 These custom socks will offer a lighter side to jittery nerves before the wedding and help prepare the bride to walk down the aisle. 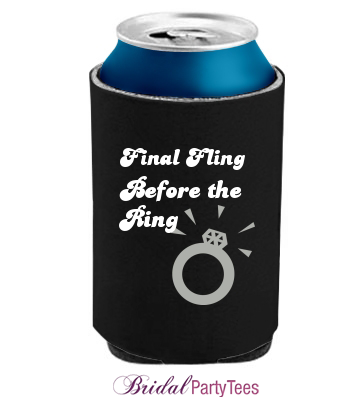 While custom socks are a great gift for the bride, they can also be fun gifts for the entire wedding party! 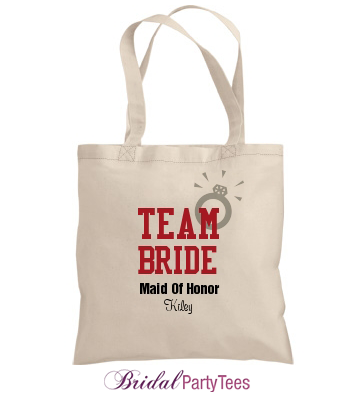 It will definitely be a unique gift for the maid of honor and bridesmaids, but don’t forget about the fellows too! 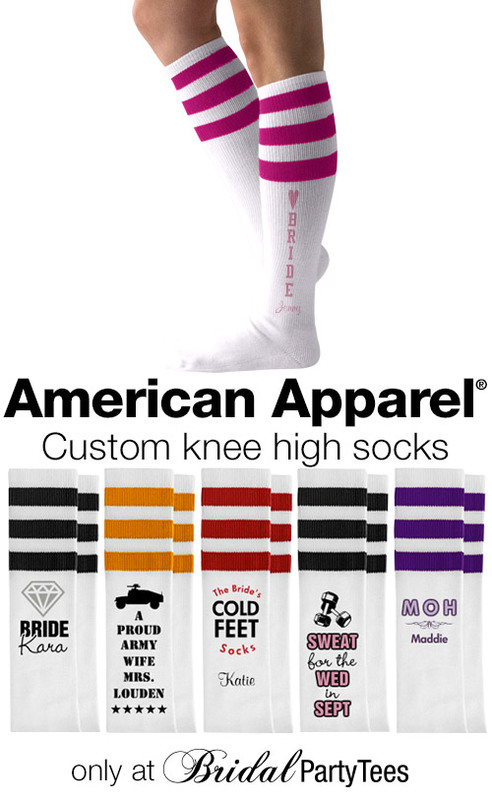 The American Apparel socks we offer are unisex, meaning the groom and his groomsmen can have an amusing hidden flair to go with their tuxes too! 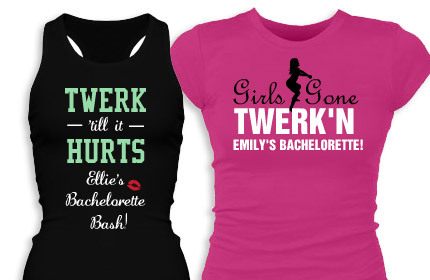 It was only a matter of time before the twerking craze made its way onto bachelorette party shirts and you know we would be one of the very first to deliver twerking designs for you to customize! Looking for a way to get the bride out of her shell and away from the wedding planning stress? Twerking and twerking shirts can be the perfect stress relief! 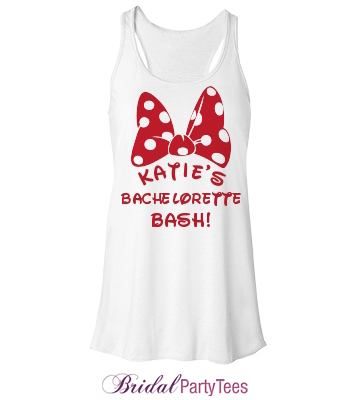 These shirts will be a constant reminder to the bride that, at her bachelorette party, she is allowed to cut loose, have a good time and not care what people think! While you can twerk alone, it is so much better to twerk as a group! 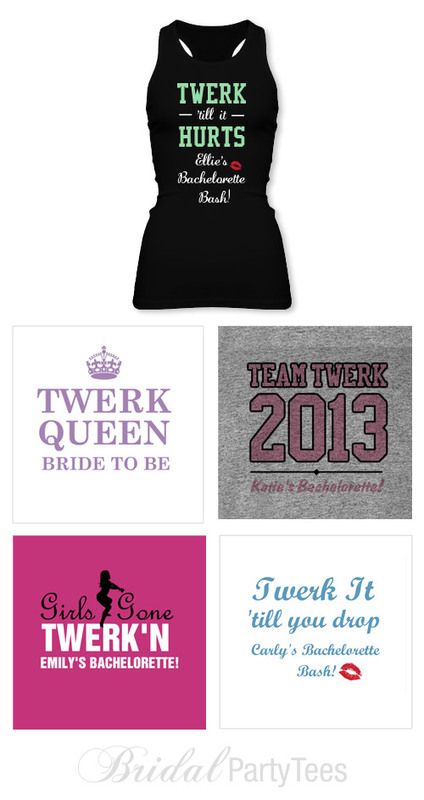 Create a twerking shirt for not only the bride, but for her whole crew as well! 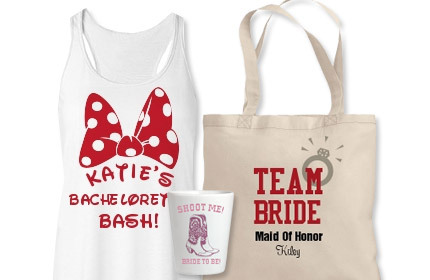 Outfit the maid of honor and bridesmaids with their own twerking shirts for the big bash! At Bridal Party Tees, you’ll find a lot of great twerking designs already created for you, but if you have the perfect twerking design idea, you can create an original using our design center too. We have lots to choose from, and believe us; the twerking craze is just beginning to gain popularity! Whether you choose a design or create one yourself, twerking shirts are sure to make any bachelorette party the must-see event! Before you know it, everyone will be twerking till it hurts! With the arrival of November, you will be busy with the holidays and planning your winter wonderland wedding. 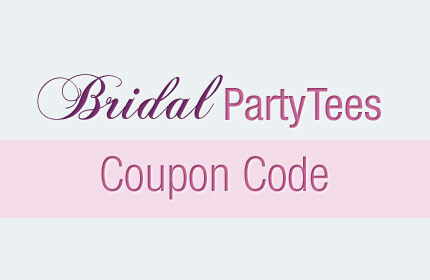 So make sure to use the coupon code below to start saving on all the wedding apparel you’ll need like bride-to-be and bachelorette party shirts for the wedding! Use coupon code BPTNOV and get 10% off your order. This offer ends on 11/30/2013 at 11:59PM EST.